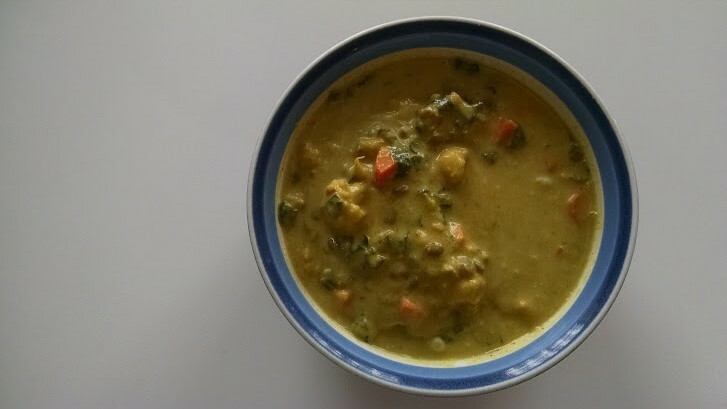 Coconut curry cauliflower soup. Say that ten times fast. I've only had this soup one time at Mendocino Farms but it was enough to make an impression on me cause it was absolutely DELICIOUS. I've made some homemade version modifications to this soup to cut the calories and boost the fiber content and I'm very pleased with the results. Definitely set aside a couple hours to make this soup. Don't let the thought of that be too daunting; soup making is therapeutic and the house will smell amazing. Read the entire recipe first, as some of the steps can be done simultaneously. I took this soup to work and it was devoured by the girls for lunch. Since there is coconut milk in it, it probably won't freeze too well but will stay good in the refrigerator for up to 10 days. Rinse the lentils and place in a medium, heavy-bottomed pot. Add the carrot, onion, garlic, thyme, olive oil, salt and water; bring to a boil. Reduce the heat to a gentle simmer, skim any scum floating on top and loosely cover. Cook until the lentils are tender, 20 to 25 minutes. Remove from heat and remove the carrot, onion, garlic and thyme with a pair of tongs. Strain the lentils, reserving 4 cups of the lentil stock and 2 cups of the cooked lentils (use the remaining stock and lentils for another recipe). If you are short the 4 cups stock, you can add enough water to make 4 cups - the soup will taste just as good! Take the cauliflower and cut off the tiny, cute florets at the top to leave whole in the soup (2 cups worth) and toss with the diced carrot in 2 tablespoons oil and 1/2 teaspoon salt. Spread the cauliflower and carrots onto a rimmed baking sheet and roast until tender and slightly golden brown, about 10 to 15 minutes. Remove and set aside for the end of the recipe. Toss the remaining cauliflower with 1 1/2 tablespoons oil and 1/2 teaspoon salt. Spread out onto a rimmed baking sheet and roast until tender, about 10 to 15 minutes; use this for the soup. ** The cauliflower roasting can be done at the same time as the lentils are cooking. In a medium, heavy-bottomed pot, heat 1 1/2 tablespoons oil over medium-high heat until hot. Add the onions and sauté until translucent, about 5 minutes. Stir in the roasted cauliflower (not the small pretty pieces), potatoes, curry powder, turmeric, cayenne and black pepper, the four cups lentil stock and two cups water. Bring to a boil. Reduce to a gentle simmer, loosely cover, and cook until the potatoes are tender, about 12 to 15 minutes. Stir in the coconut milk. Increase the heat and bring the soup to a boil, then remove from heat. Cool the soup slightly, then purée with an immersion blender until smooth. You can also purée in batches in a blender, but be careful not to burn yourself. Add the agave nectar and 1 teaspoon salt. 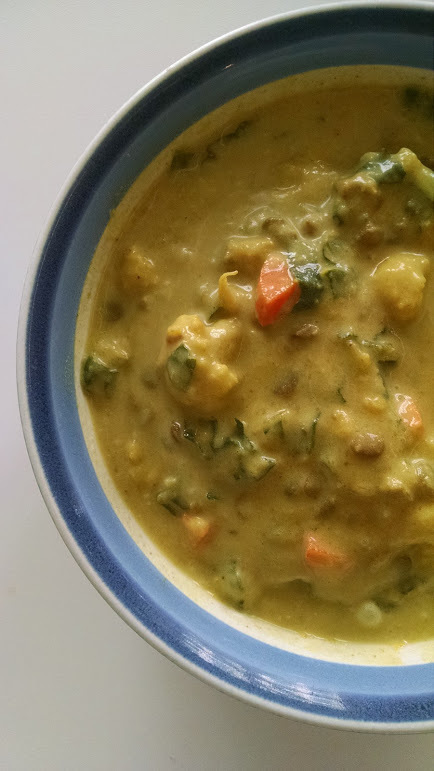 Stir in the cooked lentils, roasted cauliflower and carrots, and the shredded Tuscan kale. Gently reheat, then taste and add more salt as needed. I'm joining again this year!! 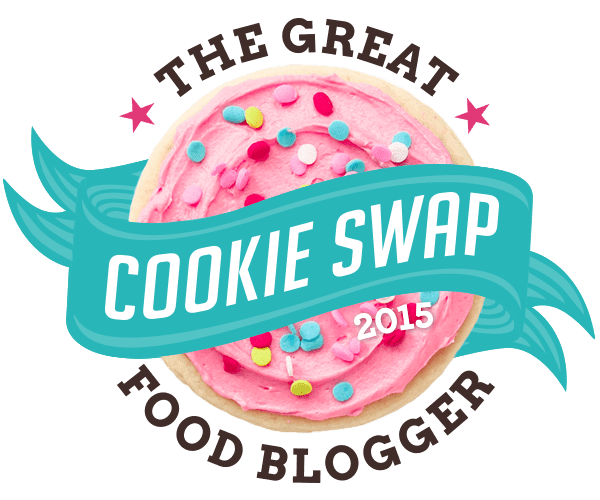 Unfortunately, I wasn't able to participate last year due to a hectic work and travelling schedule but this year ... everyone at my work will be eating cookies, all day every day. Can't wait to see what gets delivered to my door in a few weeks.